Rusty Greer Baseball School is dedicated to teaching the DEFENSIVE side of the baseball by instilling rock solid defensive fundamentals. Our objective is to offer hi-level instruction through small-group, position-specific instructional sessions partnered with dedicated skill and drill nights. 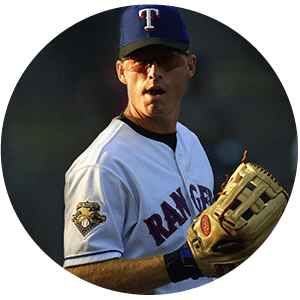 All sessions are led by former Major Leaguer Texas Ranger’s Hall of Fame Member Rusty Greer, so when you enroll, expect an all-out effort to help improve your defensive game. The success that Rusty achieved as a baseball player was derived by a commitment and dedication to each aspect of the game. Additionally, his personal philosophies as a leader, mentor, and his respect of his peers and coaches elevated his “give it your all” approach by which many players today are measured. Rest assured, when you enroll, you can expect an all-out effort to help improve your defensive game. There are three parts to a baseball game - PITCHING, DEFENSE, AND OFFENSE. The old saying goes “You win with pitching and defense”, so why do we as coaches and players focus on just two of the three parts of the game? The defensive side of the game is always the forgotten part when it comes to training and improving your overall game. Why? Because it’s hard. It’s hard to find field access, fungo hitters, catch partners, and someone who actually knows how to instruct and teach the defensive fundamentals. We take the hard part out of learning to play defense because we have field access, machines, catch partners, and the best instructor – Rusty Greer. All you have to do is show up with a glove and a hard working attitude, and we take care of everything else. THE BAT WILL SLUMP BUT THE GLOVE CAN BE THERE EVERY DAY!!! "RGBS Middle Infielders Camp was a phenomenal experience for my son! Rusty's teaching style is one that is very detailed oriented, always explaining the "why" behind a particular approach. He expects the boys to listen well, give great effort, and he challenges them to remember what they are being taught. It's more than just baseball lessons that Rusty incorporates into his camps. He challenges the boys with life-leadership experiences as well. The public speaking exercises alone stretched these boys to think quickly and be creative. We could see their confidence grow as the week progressed. I was amazed by the amount of work the boys put in over the course of the week both physically and mentally!! Rusty's positive energy regarding the sport was contagious and inspiring to these young ballplayers throughout the camp...and "G" can't wait for the next one!" "We decided to enroll not only our son, Nate, in Rusty's summer baseball camp but our nephew Hudson as well. Each day at the end of camp I asked the boys 'did you have fun?' and they would answer a resounding 'YES!!'. Next, I would ask them if they learned anything their coaches had not taught them and they would respond with more data points than I could record or digest. Ultimately, the final measuring stick was the results on the field - post camp. In my son's most recent tournament I saw evidence of the skills attained during this camp and his continued confidence building. As for my son, he will attend every camp opportunity for his fielding positions that the Rusty Greer Baseball School offers. Many thanks to Rusty and his staff!!!" "I just wanted to let you know how much my son, Ryan, loved your middle infield camp last week. It was a great experience from beginning to end. Ryan loved your enthusiasm and the intense focus on the details. He said that he learned so much from you about technique - footwork in particular- that he's anxious to work on and incorporate into his game. I was able to stick around for a while each morning and watch you work with the boys and I was thoroughly impressed. I was not surprised by the depth and extent of your knowledge because that was a given going in. However, one of the things that truly impressed me was you ability to really "teach" and not just "instruct" kids across a range of ages and skill levels. In addition to telling the boys what to do and how to do it in a particular drill, you also explained-usually in a variety of ways- why it was important and why is should be done a particular way. For players that really care about learning and improving, understanding the "why" is sometimes the most impactful aspect in terms of getting something to take root and shape their approach to a certain aspect of the game and you did a masterful job of that. Thanks for giving the boys a great week!!!" When backhanding a ball in the hole at 2nd and 1st as a right handed thrower, field the backhand off the right foot, funnel the ball, open the left foot to clear the hips, stay "in the doorway" and throw the ball UPHILL to the pitcher covering the bag. When catcher's come out of the hole to catch a popup they must begin their turn to find the ball as the start across the plate. Once the ball is located throw the mask so it won't be stepped on when trying to make the catch. When turning a double play while holding the runner at first, shuffle off (right foot to square) and read the ball. As ground ball hit at you or to your left, as a right handed thrower, make a spin move to insure the feet and shoulders are in line with the tartet. from the videos posted to our channel.